Bienevenidos a México! 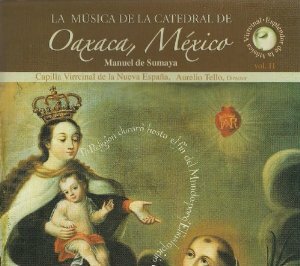 Hoy quiero hablar de un compositor, organista y director de coro mexicano de la Ciudad de Mexico (y mas tarde, de Oaxaca, Mexico), Maestro Manuel de Sumaya. I couldn’t find a picture of the composer himself, so this is the next best thing – his music. Hometown: Born in Mexico, but spent many years in Oaxaca. I love early choral works and Sumaya’s are especially nice. Here’s one of his called Angélicas Milicias, or Angels’ Army. Here’s some more music that I think you’ll enjoy. So what did you think? Nice, right? There’s a lot more on youtube, so I encourage you to check some of it out. Next up is Northern Ireland. Until then, safe travels! Tags: Composer, Manuel de Sumaya, Mexico, Northern Ireland, Oaxaca, Passport. Bookmark the permalink. Previous post ← Classical Music Changeup?